The Westing Riverfront Resort & Spa will have a Thanksgiving feast in Maya, offer two-for-one pricing on some rooms, spa specials and classes at the Athletic Club. Thanksgiving is just around the corner, and it’s time to start thinking about how to celebrate. Whether you’re planning on visiting from out of town or taking a staycation, local resorts have Thanksgiving on the brain, too. The Westin Riverfront Resort & Spa is offering specials on lodging, dining, spa services and athletics. A two-for-one deal is being offered starting at $239 per night. The deal offers a two-bedroom suite at one-bedroom pricing. The discount will be available until Dec. 20. Maya will also offer a Thanksgiving feast on Thursday, Nov. 22, from 1 to 8 p.m. The meal will be $48 for adults, with the option to pair with wine for $25, and $20 for kids. Meal options include a turkey dinner, beef tenderloin, bass and porchetta. Spa Anjali will also be offering a 50-minute massage or facial for $99 and a 75-minute massage or facial for $139 until Dec. 15. Additionally, The Westin will offer three classes on Thanksgiving Day that will be free and open to the public. The classes include Pre-Turkey Trot Stretch & Strengthen, Turkey Burner HIIT Circuit and Burn the Bird hot yoga. A Gratitude Flow Yoga Class will be offered on Thanksgiving Day, at the Vail Athletic Club, free to members and $20 to the public. The Four Seasons Resort is offering meal and lodging specials to celebrate the holiday. Grab a Thanksgiving feast to go for $275 to serve four to six people, $35 of that cost will go to Salvation Army. The fest includes a whole roasted turkey, 10 sides (including garlic mashed potatoes, duck and mushroom paella and shrimp cocktail) and either apple or pumpkin pie for dessert. Additionally, 25 percent off the room rate will be available through Wednesday, Nov. 21, 2019. 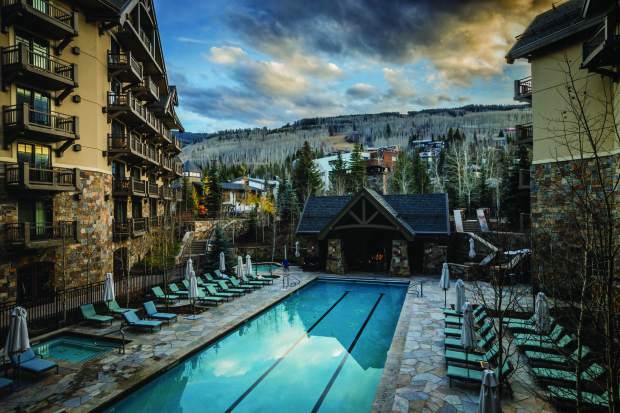 Vail Village’s Sonnenalp will offer a Thanksgiving feast for $72 per adult and $28 per child. The meal will include turkey, seafood and everything in between. Breakfast will also be offered at $28 dollars with $5 bottomless mimosas. Room rates will also be offered at 20 percent off select rooms. From 11 a.m. to 2 p.m. on Thursday, Nov. 22, Hotel Talisa will offer a Thanksgiving feast for $60 per adult and $20 per child. The feast will include turkey, ham, crab, sirloin and more. Fitz Bar & Restaurant will be offering a Thanksgiving meal for $45 per adult and $25 per child.